The 2016 Limited Editions from Habanos S.A. are here but the most significant aspect of this news is that for the first time in over half a century Americans can purchase them, for the first time we are not limited by the amount we can buy, and for the first time we can go to Cuba with little or no restrictions. I have smoked many Cuban cigars and have published many reviews and pairings of Cuban cigars and Cuban rum but there is nothing like visiting the island and experiencing the people that produce these wonderful pairing partners. A proud people with a rich history that have persevered oppression on a level that would've broken the backs of many. Last Friday I had the pleasure of entertaining a friend as we painted the town red with our wives. Wonderful dinner, hand crafted cigars, and artisan cocktails from Jimenez tobacco. After the fun we said goodbye; they were on the way to the airport to catch a flight to Cuba. The world is changing and this cigar connoisseur is willing to change with it. See you in Havana. Havana, Feb 20 (Prensa Latina) International corporation Habanos S.A. informed today about the distribution of its Limited Editions 2016 corresponding to Trinidad Topes, Montecristo Dantes and Romeo and Juliet Capuletos, a novelty for the Premium cigar market. Limited Editions of Habanos are very much appreciated and awaited every year by cigar aficionados, said the official note. These proposals are characterized for its bands which are not in the regular assortmnent of the brand's portfolio and are distinguished by a meticulous selection of all its leaves -cover, filling and cape-. The tobacco leaves are matured for no less than two years. The cover that dresses these cigars come from the upper leaves of the plant of covered tobacco plants,l another of the characteristics identifying them, as it accustoms to be darker than the cover of the bands of the regular brand assortment. In the case of Topes (vine or diameter of 56 by 125 millimeters long) of Trinidad, it is the first band introduced with that measurement in the portfolio of the brand. 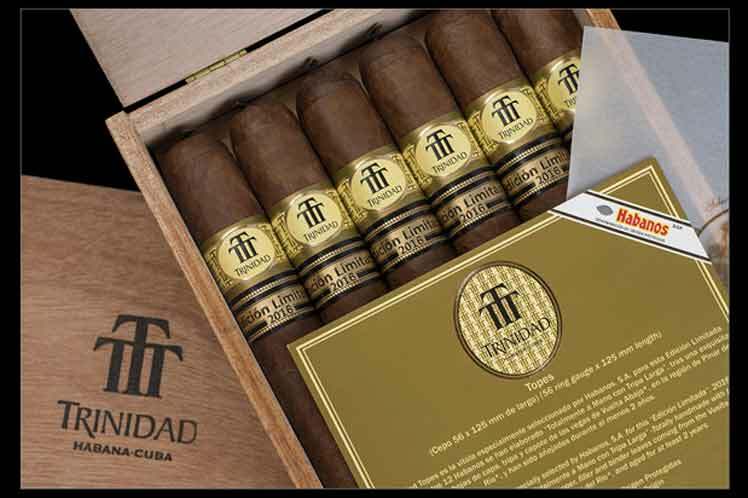 Trinidad Topes is an habano that allows a taste of that Brand in an innovative format appreciated by those who like gross calibres and strength from mild to middle, explains the tasting note. In the case of Montecristo Dantes (diameter of 48 by 167 millimeters long) is a cigar of gross to medium caliber, elegant format and strength from medium to strong. Experts also insist this is the first Hermoso (vine 48) presented by Montecristo. This Limited Edition is presented in a special case of 10 units. For its part, Romeo and Juliet Capuletos (vine 53 by 153 millimeters long) is the other Limited Edition 2016. This band is unique in the Brand and is characterized by an intense and complex flavor, assure the specialists. All these habano cigars of the Limited Editiions were rolled by hand with long filling and leaves originated iun the zone of Vuelta Abajo in the westernmost region of Cuba, Pinar del Rio, the most famous of the tobacco crop.